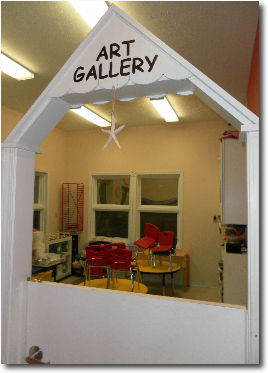 "Providing unique daily experiences for the educational, emotional and physical development of young children"
Kids Town Child Development Center is a childcare facility specializing in serving the full and part-time needs of children ages 6 weeks through 5 years. We provide the structure and education critical in preparing children for a lifelong learning experience. 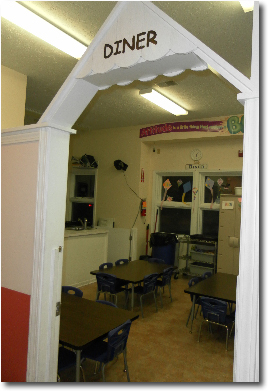 Rather than having one large room where children can spend their time however they want, we have designed our center to house six clubhouses and separate "buildings" where children play, explore, and learn about the world around them in a healthy, safe, and nurturing environment. Kids Town enhances the excitement of learning and play to create a nurturing environment by providing lower than state required ratios for the number of teacher:students per clubhouse and follows the National Association for the Education of Young Children accreditation guidelines. Kids Town has video cameras located throughout the center. The closed-circuit cameras are monitored in the administrator's office. Parents are welcome to stop in and observe at any time. For the added protection of the children, the building can only be accessed by scanning a personal I.D. card or electronically by the staff. This is the children's home base throughout their day, where their personal items are stored, and later, they enjoy rest and relaxation time. 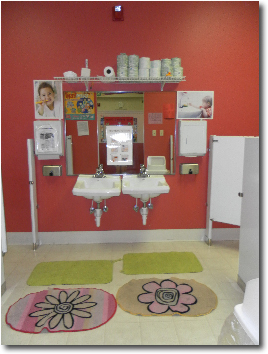 For younger children, diaper changing and potty-training facilities are located here for convenience. Our full-time cook prepares a variety of fresh, healthy meals from a rotating five-week menu. Special dietary needs for the children are considered. Children enjoy breakfast, am snack, lunch and pm snack. Table manners and social skills are part of the diner's daily curriculum. The children also create a variety of food projects with the assistance of their teachers. 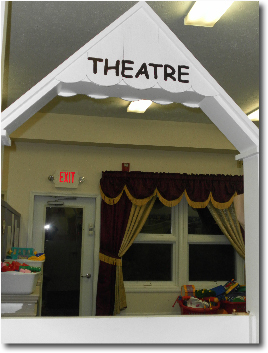 Dress-up clothing, props, dramatic play and musical instruments are only a part of what is included in our Theatre. The children's families enjoy various holiday programs performed on a child-sized stage throughout the year. Proper hygiene is an important learning process for every child. Hand washing ia a part of the daily routine at Kids Town. 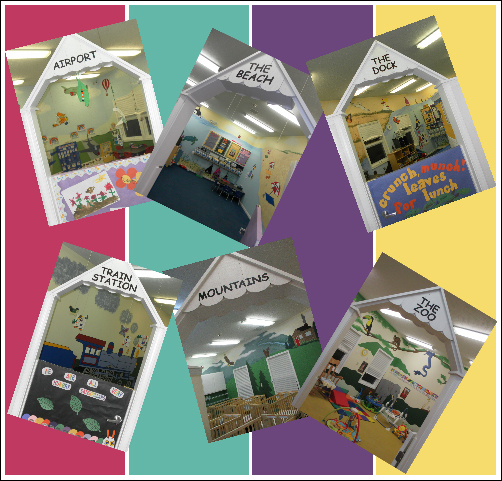 These tasks are much easier for toddlers and pre-schoolers with our child size facilities. 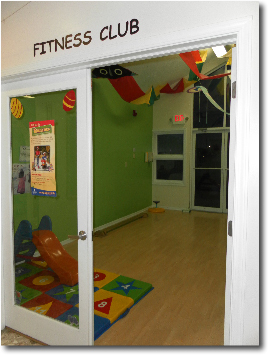 Children are action-oriented learners who will enjoy a child-sized balance beam, tumbling mats, balls, blocks, various sporting equipment, and parachute play in our Fitness Club. Brightly painted walls and floor to ceiling windows facing the Park make this the perfect place to be in inclement weather. Your young child is quickly expanding his/her language skills. 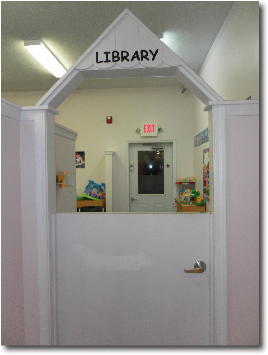 In our library, a cozy atmosphere provides an opportunity for reading, story time, word play, and puzzles. Children will also have the opportunity to use our fun, educational software in our computer lab. Enclosed by a 6-foot privacy fence, the Park has a riding track with cars and trucks, playhouses, slides, tunnels, climbing apparatus, and Harry the Hippopotamus. A large canopy shades child-size picnic tables. Our garden is also located in the Park. Every spring children plant a variety of vegetables and flowers as part of their science curriculum.